Architecture cannot force people to connect, but it can definitely plan the crossing points, remove barriers and create common meeting places that are both functional and attractive. 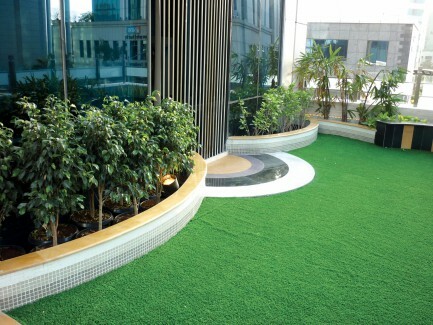 Pockets of green landscapes within a building are nothing else but pleasing organic spaces that help people connect, relax and generally revive their energy. The tight and linear space has been very cleverly designed by the architectural team with the aid of semi geometrical shapes that double the transverse dimension upon reflection against the façade of the building. While concrete depicts the innate raw beauty of architecture, greenery is its embellishment. In today’s concrete jungle, a very small chunk of the city’s skyline is devoted to green spaces. Mumbai being the financial hub of the country, its commercial architectural landscape has grown much beyond its peripheries. The city has a furious energy that keeps its inhabitants on its toes all day. Through the course of a hardworking day, if employees were provided zones that not only refresh the body but also the mind, it would only result in enhanced productivity. Landscaped areas have become an important element in this context as they offer places where recharging one’s batteries, so to say, becomes possible. 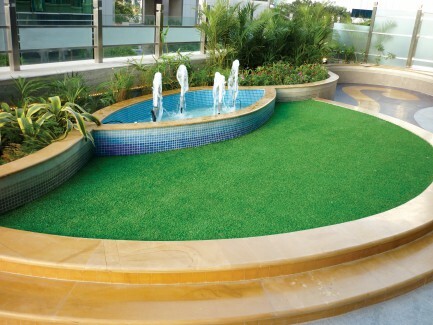 Situated in the bustling region of the city’s Bandra Kurla Complex, the terrace garden designed by Architect Kalpak Bhave on the first floor of Naman Centre is a welcome relief zone. 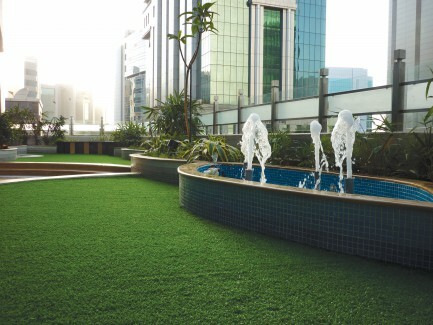 Landscapes should ideally escalate the building’s architecture and not dominate it; Bhave’s terrace is the perfect complement to the modern glass façade of this building. 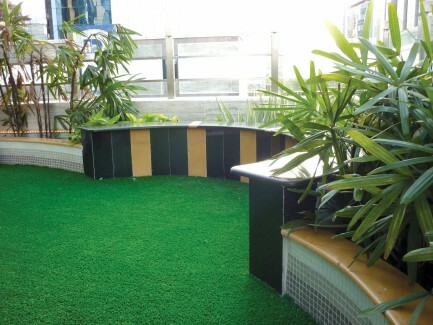 It is a soothing patch created in 900 square feet of space with simple building material and vegetation alone. The terrace has a narrow width of 12 feet and a length of 75 feet that runs parallel to the glazed façade of the building. A fountain sits at the centre of the garden acting as a focal point. Defined by beds of greenery on either side, the entire wavy belt is interspersed with lights that create a fractured look and add a sublime effect to the garden at night. Bhave tells us, “For smaller areas, every square foot counts. You need to be very specific about detailing.” The tight and linear space has been very cleverly designed by the architectural team with the aid of semi geometrical shapes that double the transverse dimension upon reflection against the façade of the building. 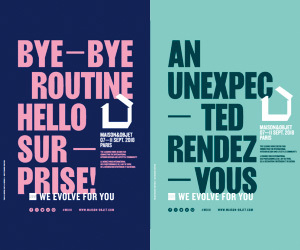 This gives the space an almost unbounded realm. 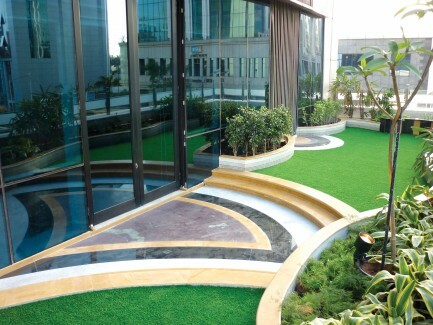 “Covering most of the available area with fresh greenery that would be visible from the offices enclosed within the building,” was the main requirement that stemmed the concept of the landscape, shares Bhave. The garden is an outstanding example of its volume divided into two by various shapes that further underline the spaces demarcated by architectural elements. The splitting up of the volume has created discrete areas for different functions. By using hard surface materials for flooring, a central water element and planting materials, the architectural team has managed to imbibe a sculptural effect in the landscape. 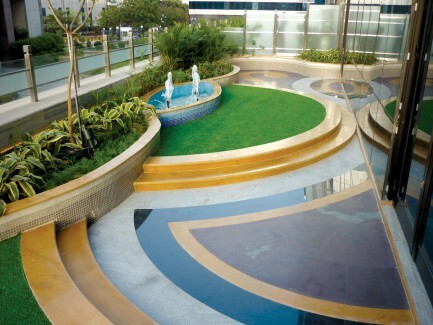 Regarding the waves and bands of natural stone, Bhave tells us, “I use natural stone over tiles in most of my projects. It brings a natural feel to the landscape.” With the natural palette used, a subtle colour gradient is achieved. Bhave’s garden stands complete with beautifully intertwining shallow levels and layers of landscaped areas. Curved stone steps rise gently to fringe manicured grass plains. A fountain sits at the centre of the plot acting as a focal point. Defined by beds of greenery on either side, the entire wavy belt is interspersed with lights that create a fractured look and add a sublime effect to the garden at night. Permanent sitting areas have been designed and concealed within the landscape reducing the dependence on movable furniture pieces. The team shares, “The detailing of the landscaped areas has been done in such a way that there is no scope for leakages for the next ten years at least. The main cause for leakage is water and soil coming in contact with the building structure. With planting done solely in pots, this possibility is eliminated. A special arrangement makes sure that the fountain water does not touch the walls. This ensures there is no leakage from the fountain as well.” The team has met the constraints of a small space with solutions that lend optimum creativity. By using potted plants, they can work on a completely new look every couple of years by merely changing the plant varieties. “Even the fountain can be converted into a flower bed whenever desired,” shares Bhave. The terrace is ideal for small gatherings and encourages informal meetings. It is also apt for entertaining important clients. Permanent sitting areas have been designed and concealed within the landscape so as to reduce dependence on movable furniture pieces. A bright umbrella that stands tucked in the corner poses as a visual delight creating the perfect ambience for conversations over coffee. The landscape detailing has been done in such a way that there is no scope for any leakages for the next ten years at the least. With planting done solely in pots, this possibility is totally eliminated. The team tells us, “Plants like Areca Palms, Vinca Rosea, Schefflera, Dracaena, Euphorbia, Manihots and Plumerias have been used.” These provide a seasonal interest and the natural beauty of the different plants comes together to create a textural contrast with the hardscape. The garden echoes Bhave’s design philosophy of creating landscapes that offer a breath of fresh air in today’s busy urban life. The materials used, plants and several diverse perspectives are so cleverly employed in this small area, that the resultant space is perceived as a magically comprehensive zone for both relaxation and rejuvenation.